Each year the Common Checkered-Skipper expands northward from the latitudes where it can survive the winter -- about the 40th parallel, or Philadelphia (Shapiro 1970b; 1966; Cech 2005). The summer colonies in the north may flourish and breed for a few months, but usually die out over the winter. Nonetheless, they often re-colonize the same locations each year. It is an interesting fact that populations of Common Checkered-Skipper in western New York successfully survive the winter, whereas those at a similar or lower latitude on the coastal plain in eastern New York do not (Shapiro (1970b; 1974). Common Checkered-Skipper was “common and general” in western New York in the 1970s, but only a fairly frequent immigrant, not surviving the winter, in eastern New York. Shapiro speculates that the difference is due to two separate post-glacial immigrations into the state by strains differentially adapted to wintering conditions. P. communis “seems to have come northward behind the ice on both sides of the Appalachians, and its distribution across the mountains is continuous only south of Virginia. In New York, the inland populations are geographically separate from the coast populations, and their presence appears to be more recent, apparently aided by human-caused disturbances favoring weedy Malvaceae. However, thus far no morphological or genetic differences have been demonstrated. Common Checkered-Skipper’s occurrences in Massachusetts probably come from the coastal plain variant, moving northward through Connecticut. The interesting question about the several-year colony in Northampton was whether there was any evidence of winter survival. The question for the future is whether, as climate warms, more incursions of this species will take place, and overwintering become possible. Common Checkered-Skipper in Massachusetts and New England is not known to use any hosts plants which are native here, but rather uses a number of non-native plants among the Malvaceae, primarily common mallow (Malva neglecta), which is naturalized from Eurasia, and other non-native mallows. Observers at Northampton Community Gardens 2001-2009 saw it on weedy mallows in a cultivated area, as did volunteers for the 1990-95 Connecticut Atlas. The skipper elsewhere also uses velvetleaf (Abutilon theophrasti), hollyhock (Althea rosea), and sidas, but none of these are native to New England. Some may be native to North America, but many are not. Therefore, Common Checkered-Skipper is among those North American butterflies which have successfully adopted non-native host plants (Table 3). In 1991 Edna Dunbar discovered a population of some 25-30 individuals in a community garden in Pittsfield, next to MAS Canoe Meadows Wildlife Sanctuary, on July 15. This population provided the only Atlas record of this species, and it was also reported on the 7/21/1991 Central Berkshire NABA Count. But it apparently died out at this location, because it has not been reported since. 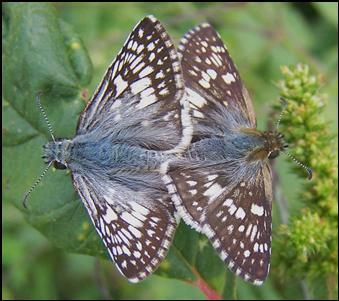 The discovery by Tom Gagnon of a Common Checkered-Skipper in the Northampton community gardens in 2001 provided the first evidence of another occurrence in the state. At this location Common Checkered-Skippers were recorded every year 2001 through 2009, and again in 2012 and 2013, and were seen and photographed by many Massachusetts Butterfly Club members. The community gardens have constant human activity all spring, summer and fall, and many butterfly watchers. The fortunes of the Common Checkered-Skippers here were eagerly observed and recorded. The skippers first arrived only in September during 2001 through 2005. Both males and females were seen, and they usually lasted in small numbers until in the second week in October. In 2006, though, the first report was on August 14. The highest number seen that year was nine (August 17, 2006, T. Gagnon and F. Model), and on September 1 a mating pair was observed by Barbara Spencer. On September 21, Frank Model and Barbara Spencer provided photographic evidence of at least one good-sized caterpillar on the host plant, common mallow. Thus, breeding was confirmed that year, and the question became whether the caterpillars would survive the winter. When in 2007 the first report was not until July 31, it appeared they had not, unless the first flight was missed. Shapiro  says the first flight begins in May in the New York Finger Lakes region. Even so, 2007 was the peak year for this skipper at the Northampton community gardens, providing new early and late dates. It was first found on July 31 by Chris Gentes, suggesting that the individuals were probably arriving from further south. By September 7 the numbers had peaked at around 20, and then 13 on September 18, and thereafter tapered off until the last one was seen on October 15. That year mating was photographed in August (see photo above), and Madeline Champagne found several eggs on common mallow on September 25, and both eggs and caterpillars there on October 6. Egg and caterpillar photos are posted on the MBC website. But only a single individual was seen in 2008 (9/7), only one or two in 2009 (9/28, 10/05), and none in 2010 or 2011, though Common Checkered-Skipper returned to Northampton community gardens in smaller numbers in 2012 and 2013. Overall it appears that this hotspot is being re-colonized by new immigrants every summer, and that the numbers fluctuate greatly from year to year. Chart 83 shows the high count reported for all sites in a given year. The peak years were 2006 and 2007. Most but not all reports are from Northampton community gardens. Because of the Northampton community gardens colony, Common Checkered-Skipper now ranks as “Uncommon” in MBC records 2000-2007, rather than Rare (Table 5), as it had been during the Atlas years. Trends in occurrence are difficult to quantify or predict for this species, since colonies are known to spring up sporadically, then die out and re-colonize elsewhere. But compared to 100 years ago, when Scudder wrote, the number of occurrences in the 23 years 1991 through 2013 is a major increase. Climate warming may lead to further increases here going forward. Between 1991 and 2013 Common Checkered-Skipper was reported from one main location, Northampton community gardens, in most years. It was also found at Pittsfield community gardens (9/1991). More recently, it has been reported from Northampton West Meadows (1, 9/19-21/2004, T. Gagnon), and Northampton/Easthampton Arcadia WS (7 on 9/23/2012, photos at http://www.garrykessler.zenfolio.com/p201283063 and http://www.pbase.com/bo_z/northampton_ma_092312 ). It has also been reported from Westport Helfand community gardens (3 on 9/8/2013, L. Miller-Donnelly), in the first report from the eastern part of the state, and from Ware (1 on 6/4/2013, B. Klassanos), in the first May report. Earliest sightings: The earliest report in 23 years of BOM-MBC records 1991-2013 is 6/4/2013, Ware, B. Klassanos. This is the first May report, possibly the first flight, but unfortunately was not accompanied by a photograph. Otherwise, the three earliest "first sightings" are 7/31/2007, C. Gentes; 8/14/2006, F. Model; and 8/20/2012, R. and S. Cloutier. All these are at Northampton community gardens. All first reports prior to 2006 were in September, suggesting that the species is tending to arrive earlier. The most numbers are still seen in September. Latest sightings: In the same 23 years of records, the four latest "last sightings" are 10/15/2007, F. Model; 10/10/2006, B. Spencer and F. Model; 10/9/2003, T. Gagnon; and 10/8/2004, R. and S. Cloutier. All are at Northampton community gardens. The two historical records quoted above may also illustrate flight date parameters. May 22, 1903 Woburn shows a first flight arrival, and November 11, 1915, Brookline may be a late date. But this November date is uncertain; Farquhar notes it with a "sic", and the existing Swett specimen at Boston University has no date label. Common Checked-Skipper outbreaks in marginal areas such as Massachusetts are unpredictable, and their flights northward may be more determined by conditions in their core range than here. However, with general climate warming incursions of this skipper into Massachusetts may well increase (Table 6), and certainly have increased compared to a century ago. And it is not out of the realm of possibility that this species could in the future survive the winter here.